In April 2016 I visited Sri Lanka. The private tour was organized by A Baur & Co. (Travel) Ltd. The organization of the whole trip worked very well. I had asked them to put the emphasis on wildlife, so we visited eight national parks and reserves, plus a whale watching excursion. I was very happy with the organization. I had one driver/guide for the whole trip. He was very knowledgeable, especially about birds. I arrived in Colombo at 5:00 in the morning. My guide was waiting for me and we started driving right away. It was a fairly long drive to Anuradhapura in the north of Sri Lanka, where I stayed for two nights. For me the main attraction there was the Wilpattu National Park. I spent a whole day on a jeep safari in Wilpattu. I saw lots of wildlife, including a Sri Lanka Leopard (Panthera pardus kotiya, german: Sri-Lanka-Leopard, french: Panthère de Ceylan) and a Sloth Bear (Melursus ursinus, german: Lippenbär, french: Ours lippu). As always, I saw a lot of different birds. The next day we continued on to Sigiriya for two nights. The UNESCO World Heritage Site Sigiriya is a rock fortress from the 5th century. If is an amazing site and sight. I had a bit of a problem climbing up the steep staircases on the outside of the rock because of my fear of heights, but I made it - it was well worth it. Especially fascinating were the Sigiriya Frescoes from the 5th century. They are amazing. The next day was spent touring the UNESCO World Heritage Site Ancient City of Polonnaruwa in the morning. There are lots of interesting Buddhist and Hindu temples around Polonnaruwa. In the afternoon I was on a jeep safari of Minneriya National Park, another place with a lot of wildlife, including elephants and abundant bird life. The next day we drove to the UNESCO World Heritage Site Kandy in the center of Sri Lanka for a two-night stay. On the way we visited the Buddhist Cave Temple at Dambulla, a UNESCO World Heritage Site. There are four caves with frescoes and many Buddha statues. In the evening in Kandy I watched a cultural dance show. The next day I visited the Temple of the Tooth, the holiest site of Buddhism. It is said to hold a tooth from Buddha. In the afternoon I visited the Botanical Garden in Kandy, seeing lots of interesting plants and animals. Especially interesting was the colony of 20,000 Indian Flying Foxes (Pteropus giganteus, german: Indischer Riesenflughund, french: Chauve souris géante d'Inde). The next day we drove to Welimada for two nights, staying in a very nice guest lodge that my tour company, A. Baur, owns. The lodge is located in a large tea plantation. The next day we drove to Horton Plains, another nature park with lots of bird life. After the second night in Welimada we drove to Udawalawe for one night with a tour of the Udawalawe National Park. The next day we drove to Sinharaja for two nights for more bird watching. We spent most of the day walking through the UNESCO World Heritage Site Sinharaja Rain Forest Reserve to watch birds. It was very interesting. The highlight was finding the Serendib Scops Owl (Otus thilohoffmanni, german: Serendib-Zwergohreule, french: Petit-duc de Sérendip), a rare endemic owl. The next day we continued on to Kirinda for two nights. The main attraction there is Yala National Park, one of the best wildlife parks in Sri Lanka. Here I saw another Sri Lanka Leopard (Panthera pardus kotiya, german: Sri-Lanka-Leopard, french: Panthère de Ceylan) and again a Sloth Bear (Melursus ursinus, german: Lippenbär, french: Ours lippu). In the afternoon we drove to Bundala National Park and the Kalametiya Bird Sanctuary for bird watching. Unfortunately, most of the birds had moved away because of the approaching monsoon season. I hardly saw any birds in this park. The next day we drove to Mirissa for two nights. The main attraction there is whale watching. I was lucky to see a Blue Whale (Balaenoptera musculus, german: Blauwal, french: Baleine bleue) on the whale watching trip. The Blue Whale is the largest animal ever to live on earth, larger than any of the dinosaurs. It was an impressive sight. The next day was the last day in Sri Lanka. We drove to the UNESCO World Heritage Site Galle for a short town tour, and then continued on to Colombo for my evening departure. 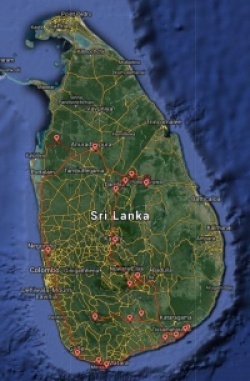 Sri Lanka has somewhat over 20 million people. 70% are Buddhist, 13% Hindu, 10% Muslim. The major languages are Sinhalese and Tamil. English is also commonly spoken. Most signs are in these three languages. Sinhalese make up about 75% of the population, Tamils make up 11%. Tourism is becoming very important for Sri Lanka. As of 2010, the service sector makes up 60% of GDP, the industrial sector 28%, and the agriculture sector 12%. The organization of the national parks is good. The parks are surrounded by electric fences to keep the elephants from wandering onto farm land and destroying crops. Sri Lanka had a quite violent past, but there was little that reminds of that. The only result of the conflict was the somewhat reduced number of animals in Wilpattu National Park. The Tamil Tigers had taken over the park and killed many of the animals. Other than that there was nothing that I noticed that would remind of the conflict. People were generally friendly. Women wear mostly skirts, either knee length or ankle length. I didn't see mini skirts. I saw few pants, other than Indian women in their traditional pants. Many men wear sarongs, a skirt-like garment. Most of them wear the sarong ankle length, but I saw quite a few men who wore a sarong that was knee length, sometimes even above the knee. The agricultural economy of Sri Lanka is mainly based on tea, rubber, coconut, and spices. Tea was introduced to Sri Lanka in 1848 by John Baker. It is still a very important export commodity. There are large tea plantations in Sri Lanka. Tea is harvested mostly by Tamil. My guide was Sinhalese, but he said that the Tamil are much better and much more conscientious workers than the Sinhalese. Tea harvesters are paid a fixed amount for working from 7:30 to 14:00 (2000 rupees/day). In the afternoon they are paid by the weight of tea harvested. The new leafs are harvested once per month. The tea plants last 10 - 15 years. I saw lots of cows, but no horses or donkeys, and very few goats or sheep. Traffic was busy in places, but usually not extremely so. Around 12. April, traffic in Kandy was extremely heavy because of a holiday. There are lots of motorcycles in Sri Lanka, almost all of them wear a helmet. Most roads are very good, they are being maintained very well. Most cars have diesel motors. The weather was mixed, it rained on most days, but usually only briefly, so it was not much of a problem. It was hot and humid, as expected. I was too close to the monsoon season, it would be better to visit at least 3 weeks earlier. On the last 3-4 days I saw hardly any birds, even in the Kalametiya Bird Sanctuary, they all left because of the approaching monsoon season. Food was OK throughout the trip, not especially good. Beer was not much less expensive than in the USA. If you want gourmet food, you will have to find the top hotels to get it. I stayed in 3-star or 4-star hotels throughout the trip. They were all fine, I didn't have any complaints about the accommodations. Strangely enough, all hotel bars close around 22:00. I had a great trip, concentrated on wildlife, just as planned, with a smaller part dedicated to cultural things. The wildlife viewing was some of the best that I have experienced outside of Africa. Some of the old monuments (e.g. 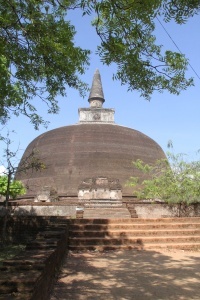 Sigiriya and Polonnaruwa) were also worth visiting. Altogether it was a very interesting trip.